Throughout the entire healing process of my encounter with prostate cancer, I have been learning to perfect the art of patience by waiting on the Lord. The closing verses of my favorite psalm also come to mind. In the Bible the word for patience has been translated to mean endurance or perseverance, steadfastly bearing up under and remaining faithful while waiting. Patience or perseverance is a fruit of the spirit that should be evident in our lives, as we wait on the Lord. When we examine one of the words translated—patience—we see a compound word meaning “to stay, remain, abide,” literally abiding under. The verb form means to stay under or behind, remain; figuratively, to undergo, that is bear (trials), have the fortitude, to persevere—abide, endure, take patiently, suffer, tarry behind. The root idea of the noun is that of remaining under some discipline, subjecting one’s self to something which demands the yielding of the will to something against which one naturally would rebel. It means cheerful (or hopeful) endurance, constancy—enduring, patience, patient continuance (waiting). It is a bearing up in a way that honors and glorifies our heavenly Father, not merely to grin and bear it. We give great honor to those who endure under suffering. For instance, you know about Job, a man of great endurance. You can see how the Lord was kind to him in the end, for the Lord is full of tenderness and mercy. LORD gave Job twice as much as he had before. is to write out a prayer for patience and pray it every day. and thus receive and carry away [and enjoy to the full] what is promised. Clearly who God is and who He has called us to be. And pray that patience may serve as our trusted ally. And say “Yes” to the rest God gives, despite the strife. As we stay our mind on Him, we abide in peace. When we praise God, works of the enemy decrease. But like Job wait until at last our change shall come. But fruit abounds to those who wait in their season. We will embrace waiting as a wonderful gift. Embracing Your Life Sentence: How to Turn Life’s Greatest Tragedies into Your Greatest Triumphs is now available wherever books are sold and online. For more details check out https://lonnelledwardjohnson.com. Truly my soul finds rest in God; my salvation comes from him. For God alone my soul waits in silence; from Him comes my salvation. From Him comes my salvation. I wait quietly before God, for my victory comes from him. I am at rest in God alone; my salvation comes from Him. We note this Biblical definition of patience which has also been translated endurance or perseverance, steadfastly bearing up under and remaining faithful while waiting. Patience or perseverance is a fruit of the spirit that should be evident in our lives, as we wait on the Lord. O what a foretaste of glory divine! Born of His Spirit, washed in His blood. But with patience we must still learn to watch and wait. Our God has been ever faithful and never late. We trust in the Lord, as the Word of God extols. Assured that in patience we now anchor our souls. And bear up under and yield fruit of endurance. And through faith and patience claim our inheritance. Watching, waiting, seeking to fulfill all of God’s will. Meditating on Psalm 62:1 and other verses related to waiting is great way to start the day, as we watch and wait. My comment brought to mind a previous blog entry that talked about learning to wait on the Lord with patience. I have modified the post and added a new poem at the end. Note this Biblical definition of patience which has also been translated endurance or perseverance, steadfastly bearing up under and remaining faithful while waiting. Patience or perseverance is a fruit of the spirit that should be evident in our lives, as we wait on the Lord. When we examine one of the words translated “patience”, we see a compound word meaning “to stay, remain, abide”, literally abiding under. The verb form means to stay under (behind), i.e. remain; figuratively, to undergo, i.e. bear (trials), have fortitude, to persevere — abide, endure, suffer, tarry behind. The root idea of the noun is that of remaining under some discipline, subjecting one’s self to something which demands the yielding of the will to something against which one naturally would rebel. It means cheerful (or hopeful) endurance, constancy — enduring, patience, patient continuance (waiting). It is a bearing up in a way that honors and glorifies our heavenly Father, not merely to grin and bear it. 11 We give great honor to those who endure under suffering. For instance, you know about Job, a man of great endurance. You can see how the Lord was kind to him at the end, for the Lord is full of tenderness and mercy. And the LORD turned the captivity of Job, when he prayed for his friends: also the LORD gave Job twice as much as he had before. The statement that began our discussion also reminds us of that we are currently in a season where patience, a fruit of the Spirit, should be abounding. Not only must we know what season we are in, but we must also know where we are in this season. I recall a teaching series that drew a parallel between our life’s journey as believers and the journey of the Children of Israel into the Promised Land beginning at Gilgal, symbolic place of new beginnings. From there they move on to Jericho onward to Jerusalem, going all the way to Mount Zion, the highest elevation in that beautiful City of God. As we journey through life, we perfect the art of patience or endurance or perseverance. Associated with this character trait is the idea of “waiting”—steadfastly bearing up under and remaining faithful while waiting. We close with an original poem to capture the essence of where we are and what we are doing in this season. If a man die, shall he live again? will I wait, till my change come. Waiting in Gilgal. . .
To be launched from here to our desired haven. Where agony precedes ecstasy in childbirth. Where to be transformed at last can come none too soon. Learn the art of patience. Apply discipline to your thoughts when they become anxious over the outcome of a goal. Impatience breeds anxiety, fear, discouragement and failure. Patience creates confidence, decisiveness, and a rational outlook, which eventually leads to success. In the Bible the word for patience been translated endurance or perseverance, steadfastly bearing up under and remaining faithful while waiting. Patience or perseverance is a fruit of the spirit that should be evident in our lives, as we wait on the Lord. When we examine one of the words translated “patience”, we see a compound word meaning “to stay, remain, abide”, literally abiding under. The verb form means to stay under or behind, remain; figuratively, to undergo, that is bear (trials), have fortitude, to persevere — abide, endure, take patiently, suffer, tarry behind. We give great honor to those who endure under suffering. For instance, you know about Job, a man of great endurance. You can see how the Lord was kind to him at the end, for the Lord is full of tenderness and mercy. And pray that patience may serve as a trusted ally. That we embrace waiting as a wonderful gift. Why would you ever complain, O Jacob, or, whine, Israel, saying, “God has lost track of me. He doesn’t care what happens to me”? Don’t you know anything? Haven’t you been listening? God doesn’t come and go. God lasts. He’s Creator of all you can see or imagine. He doesn’t get tired out, doesn’t pause to catch his breath. And he knows everything, inside and out. He energizes those who get tired, gives fresh strength to dropouts. For even young people tire and drop out, young folk in their prime stumble and fall. But those who wait upon God get fresh strength. They spread their wings and soar like eagles; they run and don’t get tired; they walk and don’t lag behind. 28 Have you never heard? the Creator of all the earth. He never grows weak or weary. No one can measure the depths of his understanding. 31 But those who trust in the LORD will find new strength. In Psalm 103:3-5 (NLT) we find another reference to being renewed like the eagle. 5 He fills my life with good things. A previous blog post discussed waiting on the Lord in relation to the character trait of patience or endurance or perseverance, steadfastly bearing up under and remaining faithful while waiting. Patience or perseverance is a fruit of the spirit that should be evident in our lives, as we wait on the Lord. In examining “patience” in the scriptures, the term is translated “to stay, remain, abide”, literally abiding under. It means cheerful (or hopeful) endurance, constancy — enduring, patience, patient continuance (waiting). It is a bearing up in a way that honors and glorifies our heavenly Father, not merely to grin and bear it. They that wait upon the Lord shall renew their strength. They shall mount up with wings as an eagle. They shall run and not be weary. They shall walk and shall not faint. Wait, I say, upon the Lord. To see the goodness of the Lord in the land of the living. Wait upon the Lord, and he shall strengthen your heart. There are times when you may feel your strength is almost gone. Pressed and beset on every hand, you just can’t seem to carry on. Your strength He promised to renew. He will encourage your heart. At times it seems you are always climbing up an endless hill. All the pressures and the trials of life have broken down your will. Those about you seem to doubt you and say this is the end. Don’t give up; try one more time. Straight ahead is the finish line. The Lord will give that second wind. You have seen what I did unto the Egyptians, and how I bare you on eagles’ wings, and brought you unto myself. The way of an eagle in the air; the way of a serpent upon a rock; the way of a ship in the midst of the sea; and the way of a man with a maid. 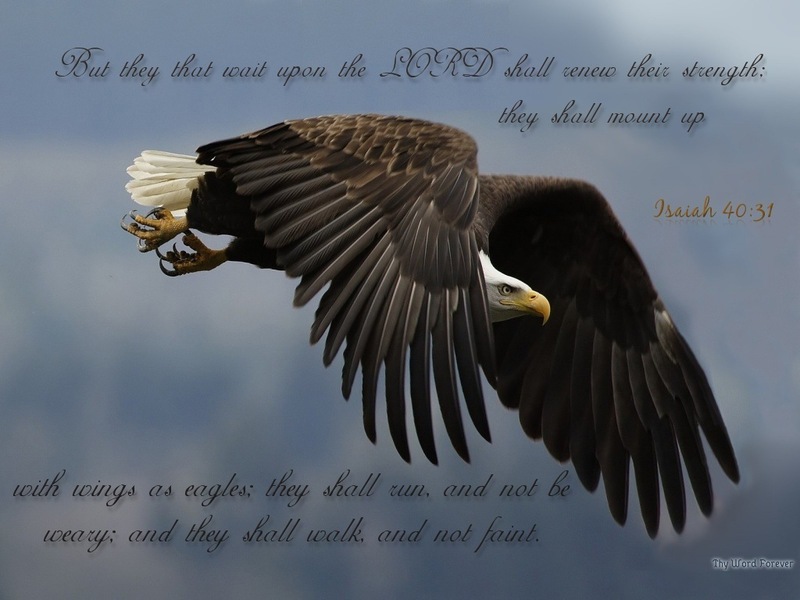 Of course, one of the most recognized references to eagles occurs in the Verse of the Day from Isaiah 40:31. Lee in his blog “Birds of the Bible” examines “Birdwatching from a Christian Perspective” and provides fascinating commentary on “eagles” with references to Isaiah 40:31 and other scriptures, along with astounding photography of the growth stages of an eagle. Lee notes that the eagle spoken of in Scriptures is actually a golden eagle, indigenous to the Middle East and beyond, rather than the bald eagle which is found throughout North America. Jeff Conte offers a moving rendition of “Wings as Eagles,” based on Isaiah 40:28-31 with a video clip of an eagle in flight. This video played during Bald Eagle Watch Month reminds us of the awesome beauty and majesty of some of God‘s most amazing creations: eagles.